1. It was interesting how he differentiated between a mission statement and a mantra with the importance of keeping it short and memorable. As well as having different mantras for different groups of people like customer versus workers. When starting a mushroom business in Sierra Leone we should have two memorable mantras for the workers and for the customers. 2. His 10/20/30 rule is cool and speaks to his other point on having a short mantra to get information across. It is a big problem with losing people’s attention when trying to get a point across and having 10 slides, a 20 minute presentation and having the smallest font of 30 pt makes a lot of sense and like something that I would actually pay attention to. We need to make sure we know our content and have lots of visuals to keep our presentation interesting. 3. Guy’s graph of ability to produce a unique product or service versus the use to customer is interesting because it simply illustrates where to be successful and where people fail and how. We aim to be in the top right corner with high ability to produce a unique product with high use to the customers. 4. Next, his word choice of hiring infected people stuck with me because it really tells to the type of people to hire. Not just passionate but infected with the passion. Infected also suggests that it can rub off onto other people which is a vital aspect. We need to be infected like that to hope to infect others. 5. Lastly, his point of not letting “bozos” bring you down is very important. And his use of the word “bozo” also made it more memorable because it set it aside from the normal phrase of “don’t let people bring you down.” If we believe that we are going to fail because people tell us we are then we are doomed already. His point of being aware of the dangerous bozos, the smart people, bringing you down was also important. We’ve already had a professor tell us that growing mushrooms in Sierra Leone isn’t going to happen but we need to problem solve to make it happen. 1. We need to validate how mushrooms are perceived in their society. Gross? Luxury? Medicinal? 2. The common way to prepare mushrooms. Dried? Cook? Raw? 3. When mushrooms are eaten? Special occasions? When someone is sick? 5. What kind of mushroom do they eat when available? Would they only trust that one? 6. Do they have easy access cold storage areas? 7. Would they eat in in portions as a main dish? 8. Would people rather become entrepreneurs or work for a main mushroom production system? 9. What are people’s current knowledge of mushrooms and mushroom production systems? 10. If both their normal wild mushrooms and the other mushrooms are available which would they choose? 1. Is Sierra Leonne too hot for mushroom production? 2. Can we keep things clean enough for no contamination? 3. Are the materials we’re using available in Sierra Leonne? 4. Would the available replacements be sufficient? 5. Would we need to make another DIY pressure cooker? 6. Could they keep a culture going or would they need to keep getting more plugs? 7. If we find we can cut out some pasteurization steps here would it still be possible over there? 8. Would we need isopropyl alcohol to make up for their dirty water in simple cleaning steps? 9. Is it too expensive to make the right growing conditions in Sierra Leonne? 10. Will the blocks be successful enough to do 2nd rounds of grow runs? I bring past experience of growing up on a mushroom farm to the team. The weakness there is we have access to lots of advanced machinery and resources to refine the mushroom growing process and I cannot translate that process I’m familiar with to these “primitive” methods we have to use. I know many solutions to our problems but the solutions are not feasible with what we are trying to do. That past experience has also blinded me to other options. One thing I could do to strengthen our presentation is to better cover my slide about why mushrooms offer solutions in Sierra Leonne. There were quite a few comments both by judges and students asking for more explanation which was my job. A second thing I can do is to have shorter answers to questions that are more to the point instead of elaborating on my answer. Along with that, a third thing I can do is to not add onto someone else’s answer, and to think more before hand if my addition is really bringing good information. A fourth thing I can do is to not be frantic to make sure I answer questions solely for the purpose of making sure Marc doesn’t answer everything and take more time to think about a good answer and take the questions I have developed, thought out, efficient answers to. Fifthly, I could practice my slides more and better compile an outline of what I want to say. In practice, what I said for each slide changed a lot, both in content and order of presenting. With better preparation, I could make sure I cover what I need to in a consistent, logical order. Sixthly, I could work on my public speaking to better emphasize and communicate the commonly unknown mushroom terms and all of the presentation in general. Stumbling on words detracts from the information so lessening that is a good thing to work on. Seventhly, I could work on my enthusiasm to better excite the audience on our topic. Specifically, I need to work on ending my slides on an high note as opposed to trailing off and getting softer. Eighthly, I need to work on my hand gestures to not distract from my speaking and so they look professional and not fidgety or make me look nervous. Ninthly, I need to work on my language bank. There were a few comments on the use of the word “hopefully” and I don’t know if that was me or not but I need to ingrain it into me to not use words along that line. Lastly, I need to work on making and memorizing a question bank of questions and answers. We talked about it before hand but never laid out a concrete bank to add too. Being able to review that with more set answers will help to make answers shorter, more to the point, an unnecessary for any group member feel they need to add more after another already answered because everyone would have discussed before hand anyways. Our work does not require IRB strategy. We are not doing research with human subjects. While we still need to submit a form to make sure, we are confident that because our work is mushroom production centered, that our project does not apply to the IRB strategy. 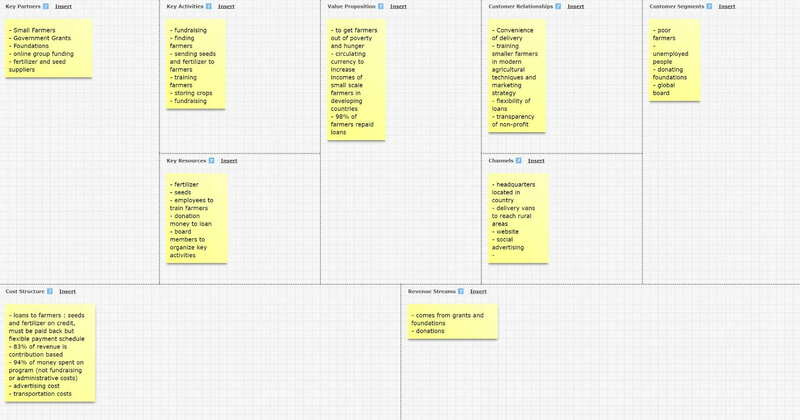 A logic model for our venture is with inputs, outputs and outcomes. Our inputs will be funds such as the EPA grant, to fund our research for the best mushroom production process. Other inputs are materials, with getting agricultural waste of rice straw from farmers. Another input is labor. Outputs will depend on our business model. If we sell MSPs, outputs will include mushroom production houses sold. With a central mushroom factory, outputs will be wages paid. For both, a main output will be mushrooms grown. For other outputs, we could measure mushroom production houses paid off, the wages made by the farmer before and after the mushroom house, and how many pounds of mushrooms sold. For outcomes, the goal is a better quality of life, better diet, and better work stability. Most of my experience with the design process has been related to my engineering classes in high school. We followed the standard circular flowing engineering design process that has now been drilled into everyone’s minds. It starts with defining the problem, planning solutions, making a model, testing the model, then reflecting and redesigning. My experience designing houses and gadgets to solve simple obscure tasks using this process has been successful but boring and rigid. We were pushed hard to follow the staple engineering design process to the T. Going off of it, I would keep the main principles but keep it more open to address problems and make it better as ideas come. I tend to try to think of all problems in the beginning brainstorming phase which has stagnated the flow of many designs but I find it more efficient to address clear problems from the beginning. The possible lack of creativity versus function is a sacrifice I tend to make. But working in a group would help me keep moving and do rapid prototyping. Where I do not have restraint is cost, so my design process would tend to first design an expensive version which can then be redesigned down to be more affordable. I would also prefer to incorporate working with other people in the design process. For example, a common baby name selection process is for the two parents to each make a list and have a certain number of super likes and hard nos to narrow it down to one list to further analyze together. Then it most likely comes down to between two names and more outside opinions would be brought in to help make a final decision. My design process would probably be similar in terms of going through the steps of the design process with input from different levels of partners along the way. In choosing people to oversee the design process and give input, it is important to keep in mind who you are designing for. A commonly female product shouldn’t be prominently designed by men. Recently I went into a modern movie theater bathroom where the sinks each had its own blow drier right next to it like a separate faucet nozzle. The boys bathroom had about three sinks to five stalls and two urinals and I was told that the design was inefficient because by combining the hand washing and drying into one station, people will have to occupy the space longer, backing up the lines. However, in the woman’s’ bathroom it was almost a 1:1 ratio for stalls to sinks which eliminated that possible hold up. The designers were most likely working with bathroom use statistics, making them choose to put more space and plumbing to the female bathroom because more females tend to use the bathroom more often. The sink was also cool because the blow driers blew the water right into the sink instead of on the ground. I will validate my project concept, technology, usability, and operational/business model by doing lots of testing and getting feedback from many different users. By making a detailed usable prototype to be put into use it is an effective way for people to actually interact with the design instead of thinking about it in concept. It also allows possibilities for issues I would not have even thought of. Especially for widely used items, used by a diverse population, it must then be tested by diverse groups for diverse feedback. For validation, the people to be using the product must be the ones to validate it or else it is not doing it’s targeted purpose. My philosophy of engagement with communities, partners and markets is to be open and communicate with others. I like working in teams to bounce ideas off of each other. It makes the design process go much faster by running through ideas with many different minds. Engagement with different cultures is also important in expanding design possibilities as well as being aware of issues to keep in mind. When going to a foreign country, common goals are to learn and experience a new culture and to teach others of yours. Going to Sierra Leone to grow mushrooms, we must take into consideration their cultural norms. Firstly, women mushroom farmers may run into problems with obtaining agricultural waste from other farmers in terms of discrimination against women. Secondly, we need to take into account their problem solving. Learning about the vast differences in how people in different countries approach problem solving, we do not know how Sierra Leone mushroom farmers would approach an issue. Will they keep quiet and try to figure it out by themselves? Turn to a manual? Ask around? In attempting to make it as easy as possible for the new farmers, we need to learn how to best help when needed. Lastly, mushrooms are not often part of their practices for both farming and consumption. We will need to do well in communicating with the people to get this foreign concept across to them. For example, a small percent of the population is allergic to the spores either through inhalation or consumption. However, cooking the mushrooms before eating cooks off the spores and gets rid of that risk. From my experience selling mushrooms directly to customers at our local farmers market, many people are used to eating domestic button and portobello mushrooms raw. However, we sell varieties of wild mushrooms, some with more spores than others. And I have to take care to notice new or unknowledgeable customers and inform them of risks they may be taking eating certain wild mushrooms raw. But if someone with an allergy to the spores consumes them, they would only suffer a stomach ache. While women are less discriminated against in the united states, it is still prevalent. For example, I had to deal with harassment from a gas station worker every time he was there. He would try to convince me to smile every time I went in to purchase gas with cash and it made me uncomfortable to the extent where I never visit that gas station anymore. Lastly, I often do not want to turn to experts for help because I wish to find ways to figure the problem out myself. So to address that personal norm, detailed, clear instructions would be most helpful. Cultural practices that can be leveraged to address community and market problems are their good views of Americans. Because they tend to look fondly upon Americans, by suggesting changes to their system they may take more care to listen and try to put the suggestions into practice. Secondly, we already plan to leverage Sierra Leone’s large unemployment rate to cater to those available to utilize our mushroom production systems to get them jobs add to the market. 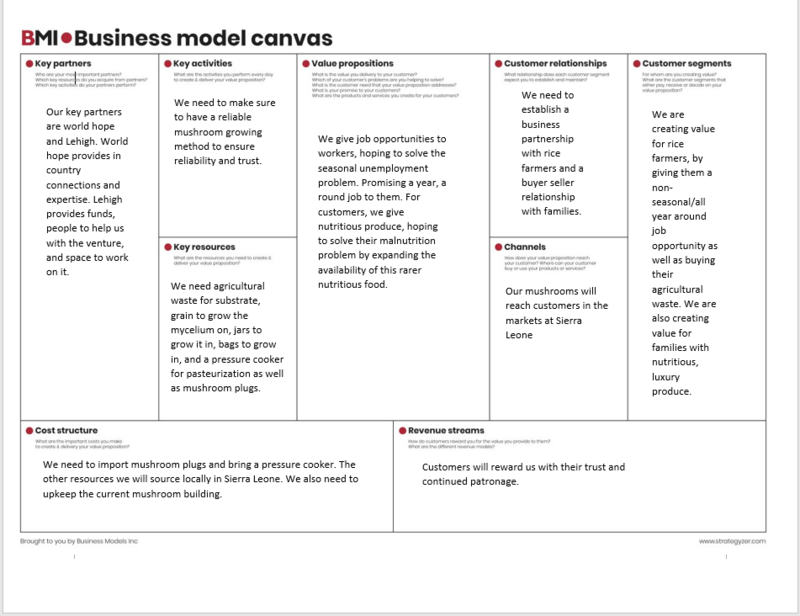 Lastly, we can leverage the absence of mushrooms in their culture to help the new farmers in terms of supply and demand to make a greater impact on the new farmers with pay. If mushroom are perceived as a delicacy and are sold at high rates that would be very good for the new farmers. In regards to the African context presenting differing challenges from the American context, though there may be discrimination against women in both countries, it may be to a greater extent there. Men may not want to learn mushroom farming practices from a young female. Also, the African context may view mushrooms in an entirely different way than American do. From my experience, the general first responses to wild mushrooms are either disgust or fear. The African context may be similar or it could be the complete opposite with most of them viewing strange mushrooms as a gourmet delicacy. Lastly, the African context may have problems in terms of keeping mushroom production spaces clean, compared to the vast amounts of available American technologies. Certain aspects of the mushroom production process require very sterile rooms for the most success to keep competing bacteria out of the mushroom cultures. Resource wise, Africa has different plants and farming products which will affect the mushroom substrate and grain for the spawn. In Kansas, where sunflowers are abundant and easy to grow, we use the ag-waste of dried sunflower seed shells in our substrate. We also use the wood chips from the trees often grown around us. While substrate is very lenient, mushrooms still like certain materials over others. So when growing mushrooms here we need to keep in mind if the resources we are using are available in Africa. Secondly, which has been lightly touched upon, is the different access to technologies in Africa versus America. In our mushroom production system, we put a lot of electricity and technology to refine our mushroom growing process. Gigantic autoclaves, boilers, and sterile rooms are hard to obtain in Africa. Lastly, items used in the mushroom production process must be kept in mind comparing availability in America to Africa. We may use mason jars to grow spawn but we can’t get mason jars in Africa easily. It is similar with special mushroom grow bags with filters. We have to test less conventional items to grow mushrooms in that are more available in Africa. For example, we plan on trying to replace the mason jars with beer bottles and have tried use regular plastic bags with a rubber banded filter on top. I enrolled in this course because a friend told me that she is applying to a fellowship involving mushrooms. Having grown up on a mushroom farm, it seemed like the perfect fit. It seemed like a great thing to put on a resume. Initially I applied more haphazardly with just filling out the application in engineering lecture. I truly wasn’t expecting to continue in the application process after hitting submit. Much less be accepted. However, as I continued in the application process and learned more about the program, I became more interested in the aspects of having an opportunity to make an impact on the world. I do become conflicted saying this though because as a common selfish person, I ask, “am I wanting to make an impact on the world to truly help others? Or to help myself out.” Which in the end does it matter as long as the work I do is the same? The same results benefiting everyone will occur. It will help me when applying for future experiences by sitting prettily upon my resume. My friends and family are impressed and this betters their image of me. This should also help make me a better civil engineer by letting me experience the world and different cultures as well as designing mushroom buildings. As long as I make sure to reflect and take away from the experience to further apply it. But in the end it boils down to answering “What was your motivation for applying?” with because my friend was applying and mushrooms related to a large part of my life. And for my prior interests? To make myself look better. It’s actually hard for me to believe it when people say otherwise. I just hear desperate yelling of “look at how I’m so great! Wow I’m just so amazing for seeming this kind and amazing! But people convincing themselves they’re kind amazing people lie to themselves thinking that they’re selfless. All actions are for personal gain even if its indirect. “Self sacrifice” is just the price people are willing to pay for the ego boost (as previously stated by Khanjan). This may seem like too much, inappropriate, and angry but whats the point of a blog full of lies? For a current world problem, I’m invested in respect for people of the LGBTQ+ community. (I want to make others think like me. Big surprise right?) While this issue is starting to be addressed in America, a lot of other countries are far from taking the first steps. According to the NBC News article on global LGBTQ acceptance by Julie Moreau, “80 countries (57 percent) experienced increases in LGBTQ acceptance, 46 countries (33 percent) experienced a decline and 15 countries (11 percent) experienced no change” as of 2018. (https://www.nbcnews.com/feature/nbc-out/global-lgbtq-acceptance-more-polarized-new-research-finds-n871106) Large roots of the problem to face are cultural ideas and religion. These are quite hard to address because the 1st world Americans can’t just swoop in with some mushroom plugs and start making a difference. Peoples core ways of thinking (that have been cultivated and solidifying for their entire lives) have to shift. People should treat others as equals and with the same respect as others regardless of gender identification, sexual orientation, etc. To truly treat others with respect, the first step to that is to believe it and think it and begin that bloody battle with people’s beliefs. But more realistically, the real first step is to lift laws against the LGBTQ+ community and equalize people’s rights. The next step is to at least enforce fake respect (actions without the belief behind it) by sending knowledgeable experienced people around the world to start these hard conversations and be more open about the topic and encourage learning. I began that in high school by leading panels of marginalized students to engage with their peers and underclassmen about their personal experiences, how they would like to be treated and answer questions. Even if that isn’t enough to change people’s minds, its enough to start the discussion and get the ball rolling. Another aspect of opening minds is to convince people to stray from a few words in their sacred ancient books. It would be important to first convince pastors of this way of thinking for it to then to be preached that times now have changed and beliefs should follow. With equalizing laws,enacting fake respect and spreading the open conversations about acceptance, people will slowly start to really believe it. Society will begin to shift.